This is the start of a new line of clean romances called Timeless Regency Collection. They feature multiple authors like the Timeless Romance Collections, but the stories were a bit longer. I really enjoyed each one, and I can't wait for the next one. This was a delightful story full of a lot of laugh-inducing antics and wonderful characters. I liked Lila from the moment we discovered her eavesdropping on her uncle. Her attempts to make Mortimer dislike her ended in disaster everytime. It was great to see their relationship develop into something so real and deep. A cute and satisfying romance. It was great to finally get Hannah's story every since she was introduced in The Stranger She Married. Her shyness added to her character depth, and I loved how she could also be spunky and hold her own against the pompous Duke of Suttenberg. 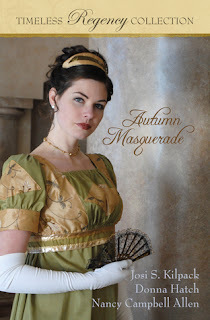 The masked ball presented a wonderful view into another side of both characters. Their banter and passion kept the story moving quickly. I didn't understand the Duke's faulty memory concerning his previous encounters with Hannah, but he grew on me as I learned more about him. A wonderful romance. I loved this novella! The twins were as different as night and day, but were close. Although, I couldn't understand how Persephone could let her sister be treated so terribly by their aunt. Her antics with the town doctor caused poor Penelope a lot of trouble. I liked how the Duke recognized the real woman he'd been corresponding with right away. Their relationship, with all its miscommunication, was charming.